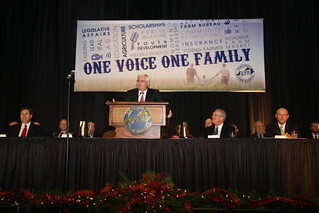 Louisville, KY (December 8, 2012) – Pulaski County farmer Mark Haney was re-elected president of Kentucky Farm Bureau (KFB) on the concluding day of the organization’s 93rd annual meeting. Also re-elected were Webster County’s Eddie Melton as First Vice-President and Hart County’s J. Fritz Giesecke as Second Vice-President. They comprise KFB’s Executive Committee along with Executive Vice President David S. Beck. Haney has served on the Executive Committee for 14 years and has been a state director since 1993. For years he chaired the State Resolutions Committee. He is a past president of the Kentucky Center for Cooperative Development and the Kentucky Horticultural Society. A former President of the Pulaski County Farm Bureau, Haney and his brother, Don, produce apples and peaches near Nancy, KY, where they also raise beef cattle. They sell fresh produce from their orchards – as well as cider, jellies, baked goods and other products – at a KFB Certified Roadside Market located on the farm. He and his wife, Marlene, have two sons and a daughter. Melton, a former President of Webster County Farm Bureau, is chairman of KFB’s State Resolutions Committee and Health Care Task Force. He also was chairman of KFB’s Farm Bill Task Force, which conducted statewide forums and sought input from Kentucky farmers on provisions of the 2008 farm bill. Melton additionally serves as chairman of the board for the Southern States Cooperative. He and his wife, Regina, have a daughter. Giesecke serves as the chair of KFB’s Beef Cattle Advisory Committee and is a member of KFB’s Farm Labor Advisory Committee and Health Care Task Force. He also serves on the executive committee of the U.S. Meat Export Federation. Giesecke has been an active member of the Hart County Farm Bureau for over 30 years where he has held a variety of leadership positions, including county president. He additionally served 25 years as county supervisor for the local soil conservation district. Giesecke and his wife, Lydia, have a daughter and a son, and farms in Horse Cave, KY.
Four new members were elected to the board this year: Glenn Howell of Fulton assumes the board position previously held by Randall Heath of Hickory, Holden Williams of Bay fills the position vacated by Charlie Benge of London, Nick Carter replaces Kevin Lyons as the board’s representative from the Kentucky Association of County Agricultural Agents, and Jason McGlone of Grayson replaces Brent Cornett of London as the new chair of the Young Farmer Advisory Committee. Other board members are: Tripp Furches of Calloway County; Kelly Thurman of McLean County; Mark Kate Kordes of Muhlenberg County; Larry Thomas of Hardin County; Patrick M. Henderson of Breckinridge County; Russell Poore of Logan County; Jay Coleman of Barren County; Scott Travis of Spencer County; Randy Chrisman of Anderson County; Joe Paul Mattingly of Marion County; David Chappell of Owen County; Terry Rowlett of Henry County; Danny Wilkinson of Adair County; Kim McCoy of Cumberland County; Terry R. Gilbert of Boyle County; David L. Campbell of Lincoln County; Alex Barnett of Harrison County; Shane Wiseman of Clark County; David McGlone of Carter County; Carroll Amyx of Wolfe County; Bige Hensley of Clay County; Marshall Coyle of Bath County; Phyllis Amyx of Wolfe County; Mickey Sirls of Marshall County; Brandon Davis of Franklin County; and Dr. M. Scott Smith of Fayette County, who is also Dean of the UK College of Agriculture. Leadership for two of KFB’s key advisory committees was also announced during the organization’s annual meeting. Jason McGlone, of Grayson, is the new chair of the Young Farmer Advisory Committee, and Phyllis Amyx, of Campton, was re-elected chair of the Women's Advisory Committee. Jason McGlone replaces Brent Cornett, of London, who served in the Young Farmer post for one year. The new vice chairs of the Young Farmer Committee are Scott Lowe, of Murray, the new secretary is Miranda Brown of Stanford, and the social media chair is Shea Lowe of Murray. The 13-member Young Farmer Committee is comprised of both singles and married couples. Those members for 2013, including the officers, are: Chris and Kendra Ammerman, Dry Ridge; Jonathan and Becky Brown, Olmstead; Josh and Miranda Brown, Stanford; Shawn and Shannon Brumfield, Nebo; Brent and Rhonda Cornett, London; Matthew and Amanda Gajdzik, Shelbyville; Colby and Sarah Beth Guffey, Albany; Michael and Laura Highbaugh, Sonora; Scott and Shea Lowe, Murray; Jason and Hannah McGlone, Grayson; Damien Smithers, Augusta. Betty Farris, of Roundhill, was elected first vice chair, and Vickie Bryant, of Tompkinsville, was elected second vice chair of the Women’s Committee. Frieda Heath, of Hickory, was elected Immediate Past Chair. The 13-member Women's Advisory Committee for 2013, including the officers are: Phyllis Amyx, Campton; Vickie Bryant, Tompkinsville; Mary Jayne Cannon, Flemingsburg; Pam Chappell, Owenton; Betty Farris, Roundhill; Sharon Furches, Murray; Terry Gilbert, Danville; Frieda Heath, Hickory; Margaret Hensley, Manchester; Sue Litkenhus, Lawrenceburg; Cathy Pleasants, Stanford; Carol Sullivan, Campbellsville; Bettie Wallace, Princeton.